I own this, just because they printed my letter at the back! Thanks editorial team! Before that page, these events happened! 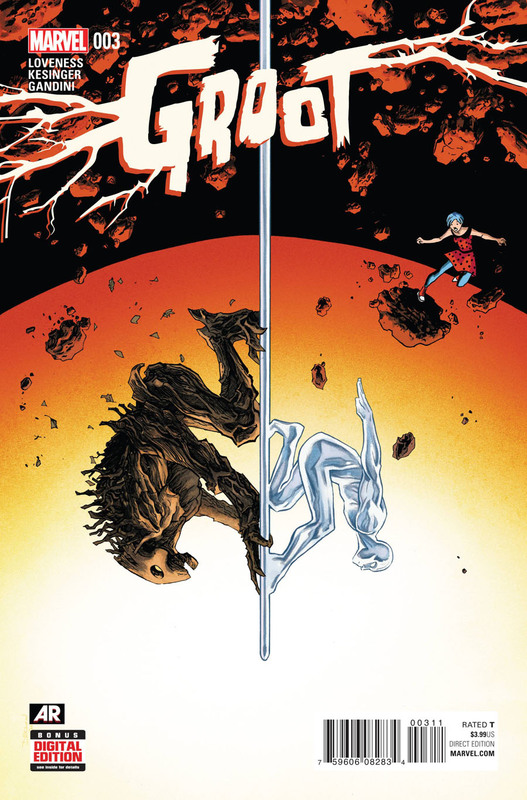 Last issue ended with Silver Surfer and Dawn Greenwood, colliding with Groot. She is concerned, as all he can say is, I am Groot. Surfer trie to explain that is all he says. Surfer references Guardians Team-Up 8, as the last time the two heroes have seen each other. Surfer starts “surferizing” which is the best term I’ve seen for his sweet soliloquies Dawn wants to help Groot. What are the chances of two people running into each other, in the vastness of space? Surfer agrees to help Groot find the person he is looking for. We know that person to be Rocket. Groot has a tracker, but it seems to be defective. Groot is super sad, and Dawn decides to let the two space super heroes have a moment. She takes Toomie, the name of his board – I should read Dan Slott and Mike Allred’s Silver Surfer, for any questions that I may have. .
Loveness and Kesinger, and the rest of the art team – give us a nice page origin story for Silver Surfer. I do like Dawn calling him, Norrin, they are clearly friends. A planet is in danger of a cosmic storm and the trio go to try to save lives. The planet inhabitants are pigs, who are awfully cute. This was all a trap, caused by Acari. I guess he is a villain, he didn’t think he would get an A-Lister like the Silver Surfer. Acari enjoys absorbing the power cosmic. This is Acari’s first appearance. Since Silver Surfer is losing his powers, Dawn can no longer breathe on this alien planet. Acari isn’t afraid of Groot, as he is a tree and Acari feeds off of suns. Groot is fought off but Groot makes time to grow some leaves, so that Dawn can breathe. A young piglet gives Groot an extensive cord. He plugs one end into the green cloud like matter, that is Acari. Groot holds the other end, essentially grounding the electricity that is Acari. Acari blows up, just in time as Silver Surfer was losing his chrome. He starts regaining his strength and permanetly gives Dawn the gift of air, sweet breathable air. Dawn puts a blanket around Norrin, a new sensation for him. It looks like they were about to kiss but Groot ruins the moment. Norrin starts to monologue but he places his head on Dawn’s shoulder and falls asleep. The inventive piglet has fixed Groot’s tracker. The adults give Groot a sweet tractor like ship. Before Groot takes off, Dawn tells him that if he is ever in Massachusetts, she knows a good bed and breakfast. Midway through the comic, I was wondering how Loveness was going to write Norrin and Dawn out of the series, as why wouldn’t Surfer see the rescue of Rocket, through to the end. If I see a Letters Page in a back of a comic, I will definitely throw an e-mail at mheroes@marvel.com and let them know it is okay to print. Now, I’m not sure if that works for every comic or just comics that are overseen by a particular editor. 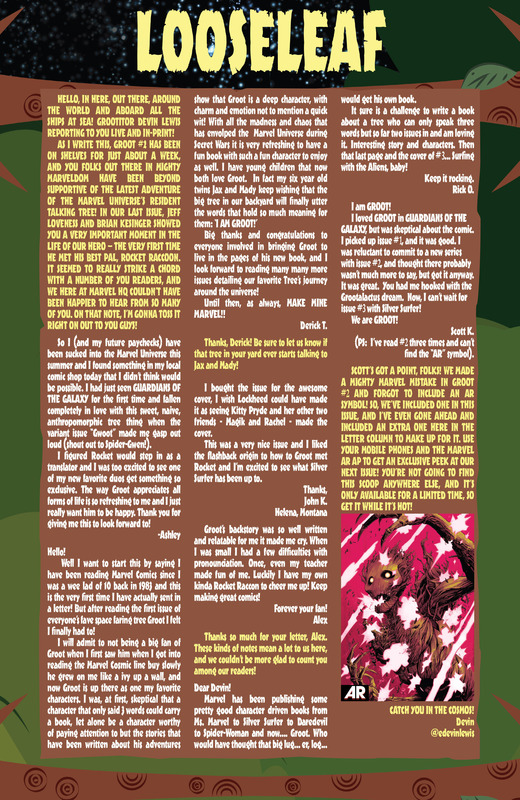 Devin @edevinlewis, printed this one but my letter for Howard the Duck 4, wasn’t printed in five. Five was the last issue, of that series, but they looked to have printed letters that encapsulated the series. Other Looseleaf letters are – Ashely, Derick T, me!, Alex, Rick O and Scott K. I’m not sure why mine was the only one that listed their city and state, maybe I’m the only letter writer over the page of 30? That’s my guess.